These Tomato Tuna Melts are a fantastic low carb way to enjoy a tuna melt. Summer has almost come to an end and I’m determined to enjoy as many fresh tomatoes as I can before the cooler weather sets in. 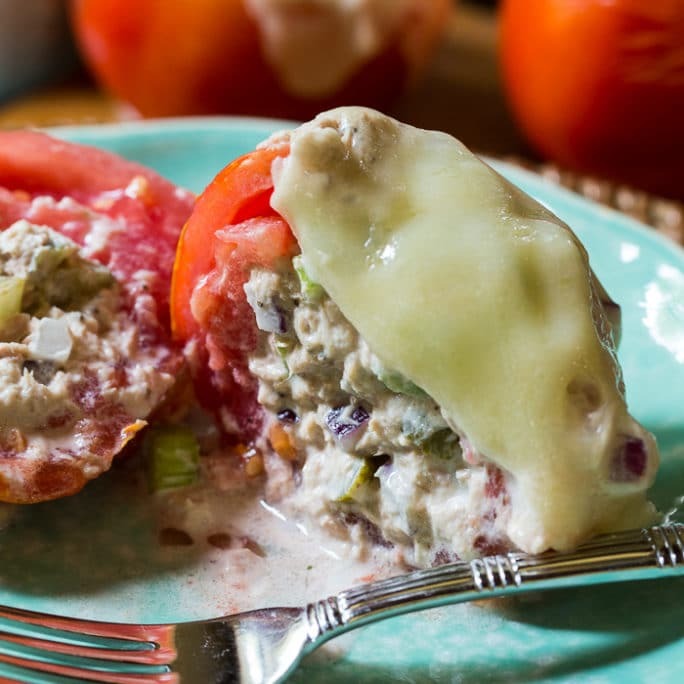 I love tomatoes stuffed with chicken salad and these Tomato Tuna Melts are very similar. First I make a creamy tuna salad by mixing in mayonnaise, celery, onion, chopped sweet pickles, and celery seed. If you don’t have celery seed, you can leave it out but I love adding it to tuna salad. Next I core about 4 medium tomatoes and stuff them with the tuna mixture. Drape some sliced swiss or provolone cheese on top and bake in a 375 degree oven for about 10 minutes or until the cheese is nice and melted. 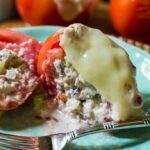 Since I like tomatoes on my tuna melts anyways, I love this healthier, low carb version of a tuna melt. You can really customize these tuna melts if you want to, adding whatever you like to the tuna salad and getting creative with your cheese choice. Try a mixture of gruyere and cheddar to really perk up the flavor. Tuna Melt Tomatoes make a delicious summer lunch and unlike a tuna melt sandwich, leftovers reheat well. All the flavor of a tuna melt sandwich, except the bread. 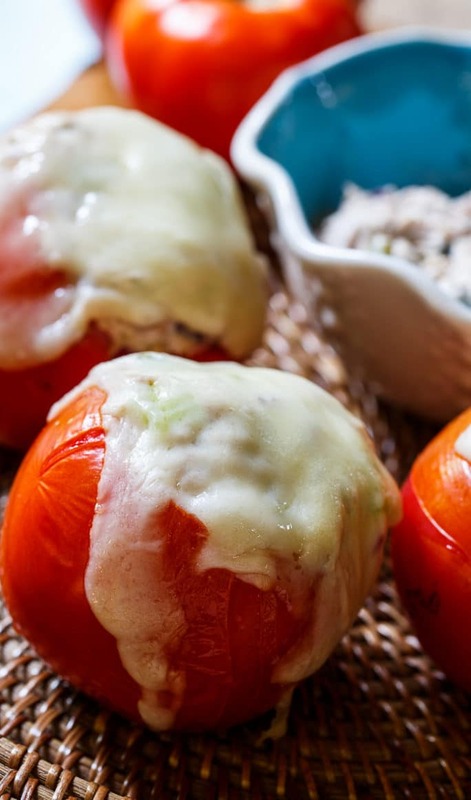 Great way to use summer tomatoes. In a medium bowl, stir together tuna, mayonnaise, celery, red onion, sweet pickles, and celery seed. Season to taste with salt and pepper. Cut tops off tomatoes and use a spoon to scoop out seeds and pulp and discard. Place tomatoes on a baking sheet. Sprinkle inside of tomato with salt. Fill with tuna mixture. This entry was posted in Lunch and tagged seafood, summer, tuna. Bookmark the permalink. This is such a great idea, Christin! I love making tuna melts on English muffins, but stuffing a tomato sounds even better. Looks SO good! 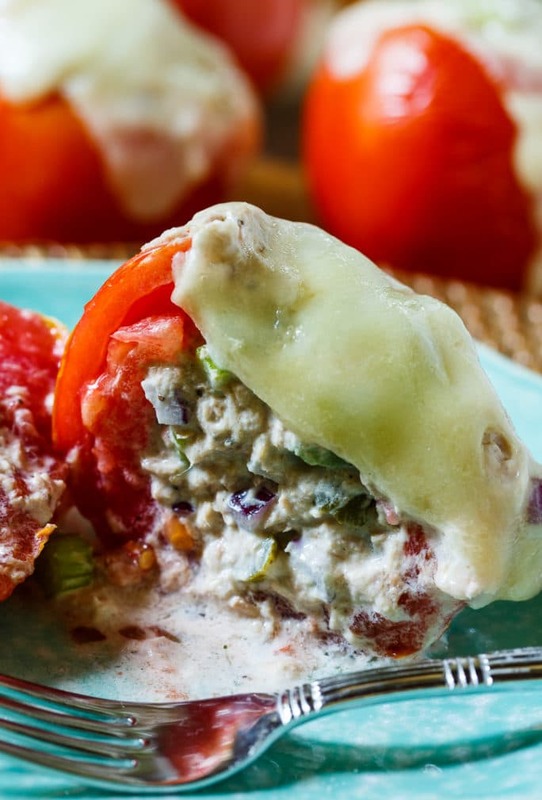 I always make stuffed tomatoes with tuna but have never thought to do it as a “melt”! This is brilliant! So delicious! !